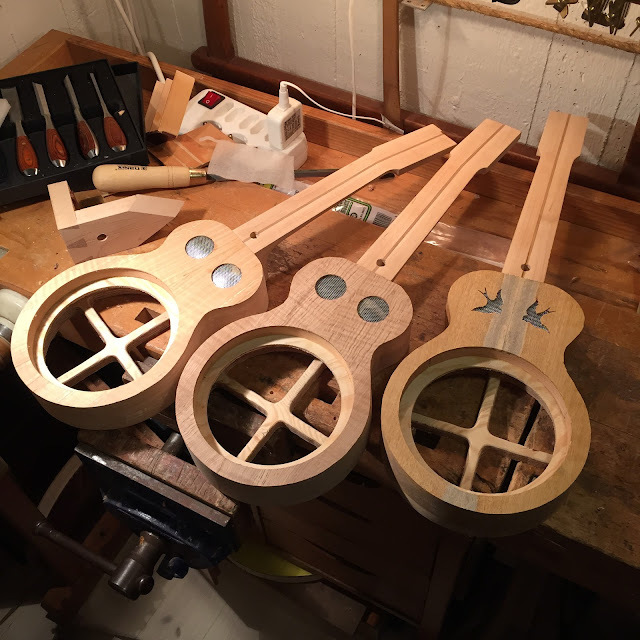 I trimmed the overhanging bits of the soundboard on all three ukes, so it was time to fit the necks. There is one step that isn't in the pics though, and that's me hollowing out the heel face slightly. 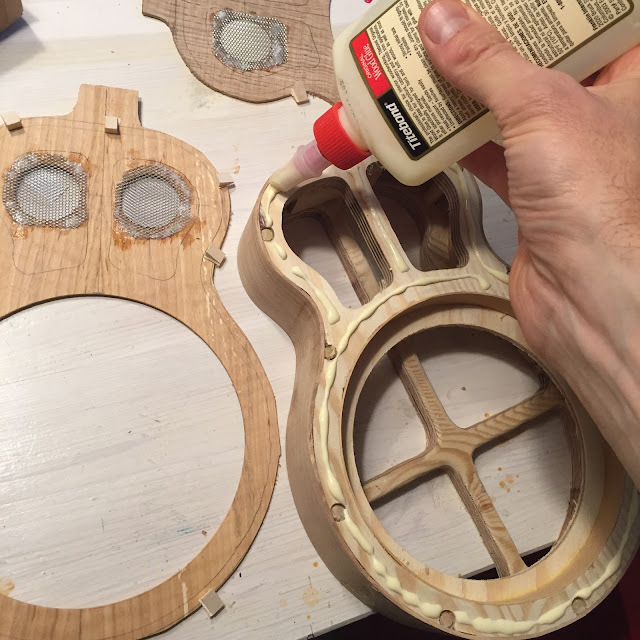 It makes sanding the heel possible since only the edges are in contact with the abrasive paper. Had the entire heel been it would've rocked and gotten round. So after that crucial step I check the neck for square. The stripe makes it easy. 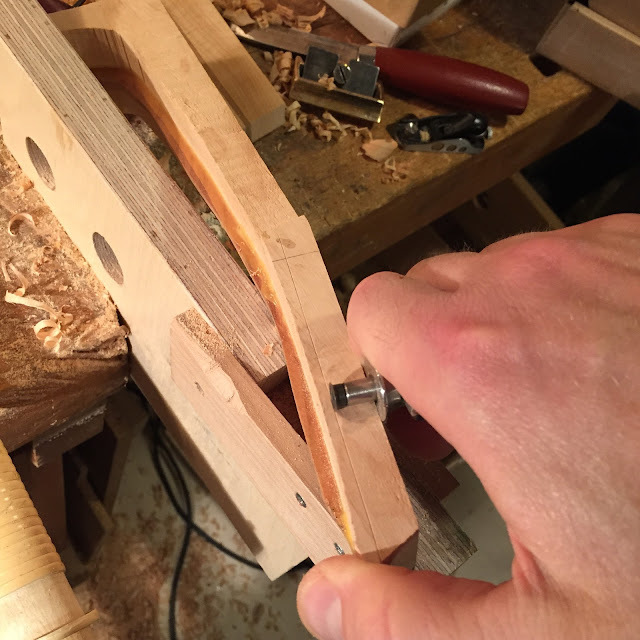 With the jig and my favourite drill, I make the two holes for the barrel bolt and the screw. 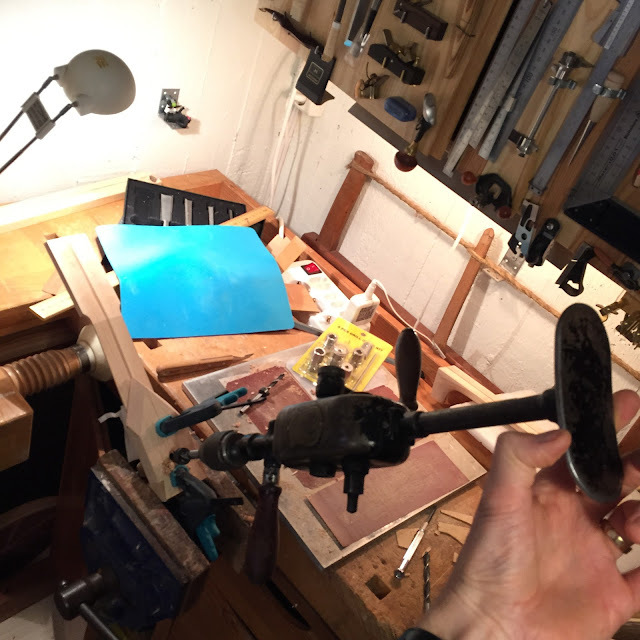 The drill had two speeds, depending on where you attach the crank. 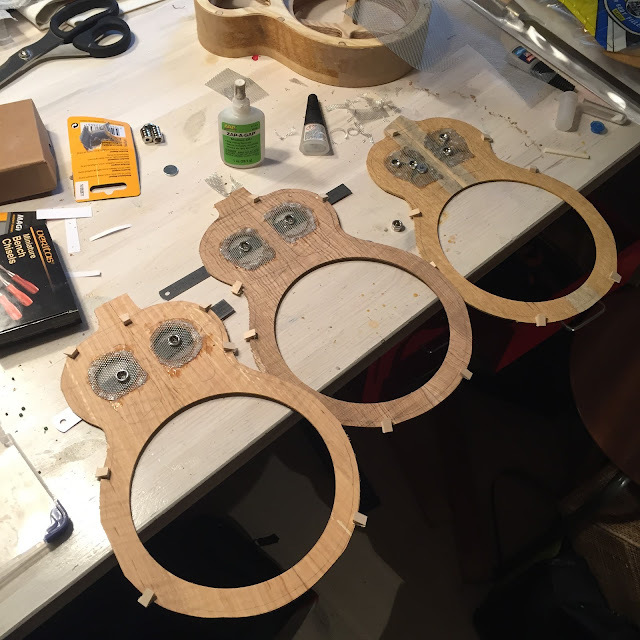 The same jig is used on the body to make the one hole for the screw. And after a little fiddling (but it did go faster than normal on these three) they're all done. 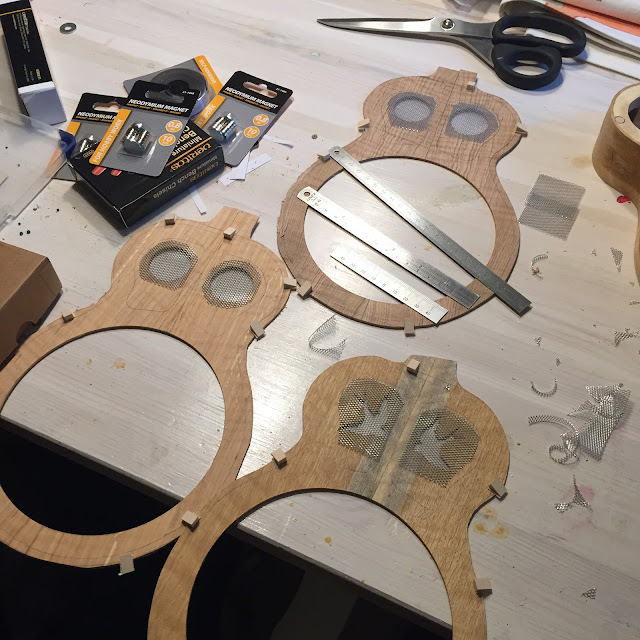 Next up, backs and fretboards! 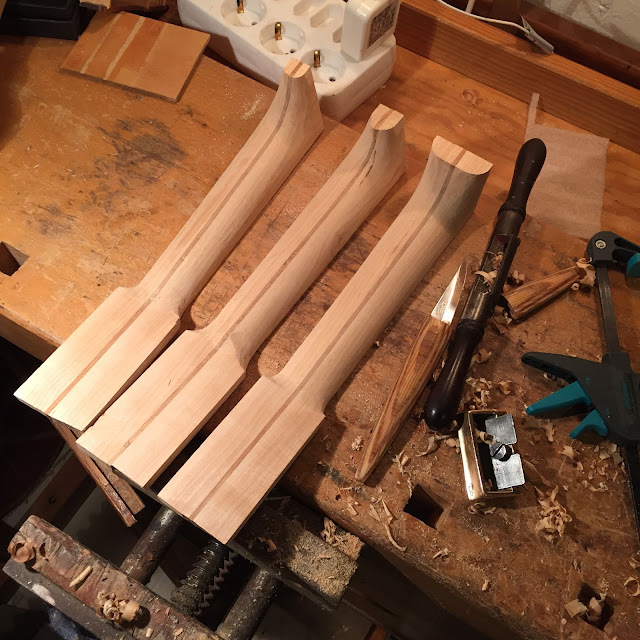 I did make a point earlier in this three-fold build that I tried to break the process into small chunks. 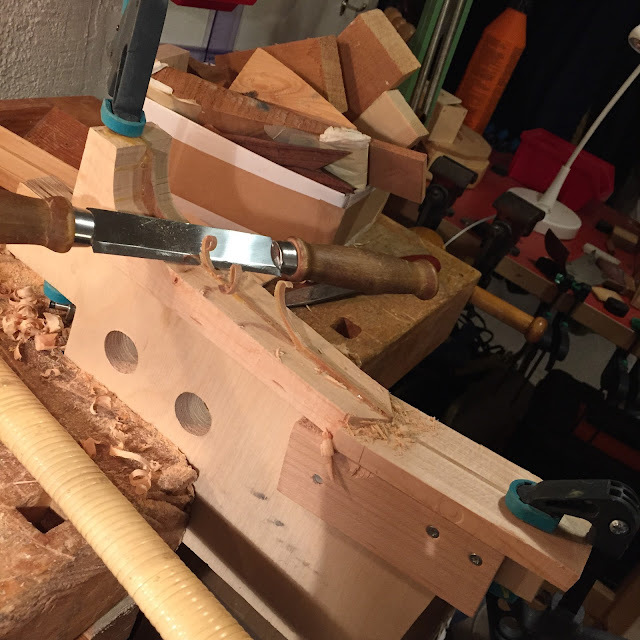 Well this morning as I lazily carved one of the necks I had to admit that one chunk would now mean one neck only. Not that it takes long but I want to do it really carefully and be done with one before I start the next. So I thought I would carve the one and maybe sand it tonight. But I sanded it too before running off to work, and then after dinner tonight I started on the next, and that's the one in the pics. 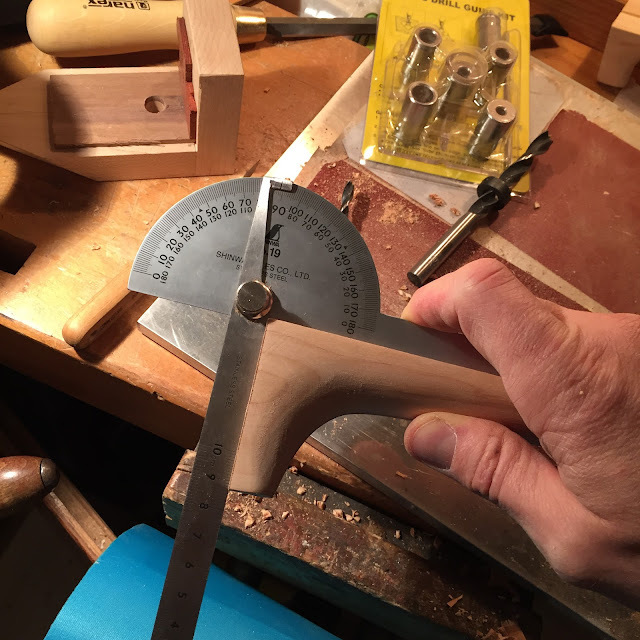 First I set a marking guage to 11 mm and score the sides of the headstock. Then I saw it to thickness. 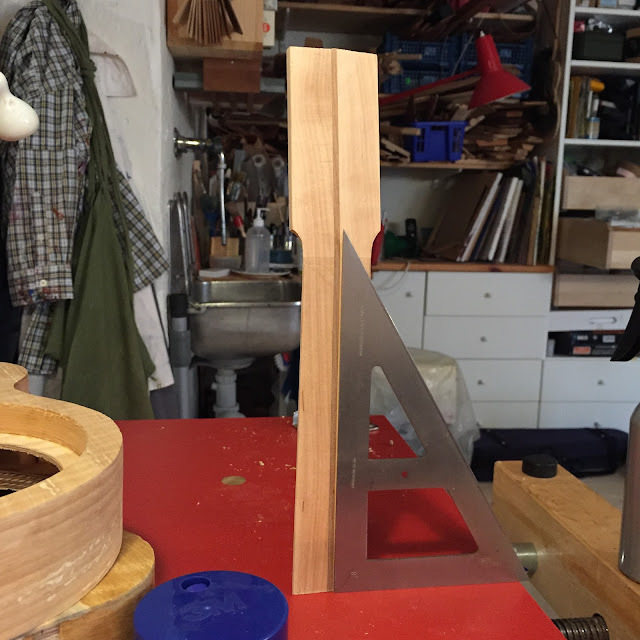 I want a rip filed carcass saw, or a tenon saw, for this (and maybe these ukes will pay for one) but until then a Japanese rip saw works ok.
Then I carve the area behind the heel, the heel itself, and a section at the nut end. 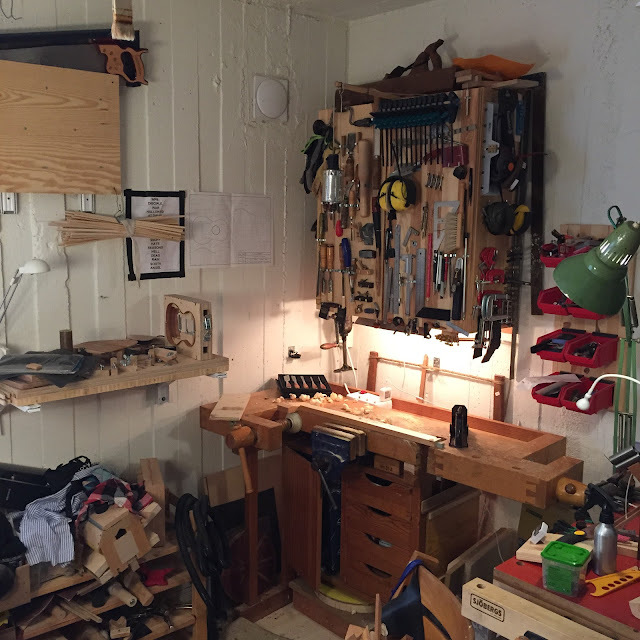 This is to provide entry and exit points for the spokeshaves, draw knives and planes I'll use. But first I took the skunk stripe down. Luck would have it that the grain in the stripe went in the opposite direction from the neck halves, so carving was interesting. 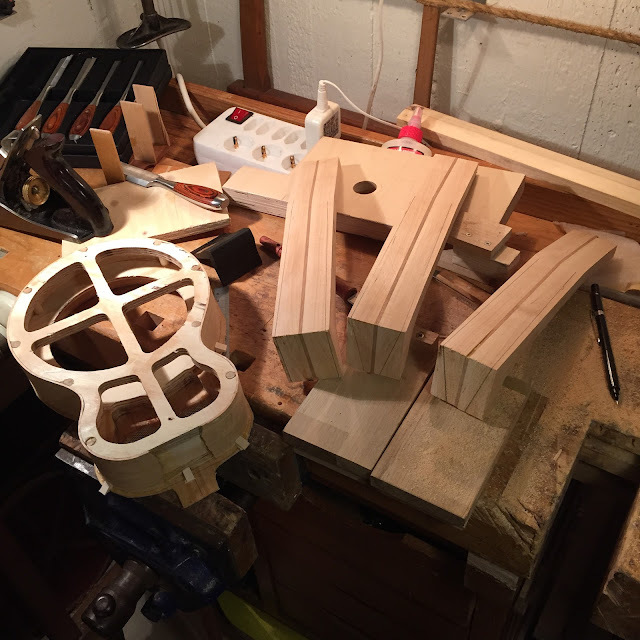 I did carve more than I took pics so here's one of the finished second neck on the jig, the first one next to it and the remaining rough blank for the third. --- a bit later I went ahead and made the third one as well. So all three chunks, or was it one large chunk, of the build were carried out today. I am very pleased. ... I were to cut them at the heel first. At the correct angle for the string height in conjunction with the well, the cone, the whole works really. That angle is (for me) 1.5 degrees and it can be a bit awkward to get it right after those rip cuts. So; what I needed to whip out was my appropriately sized carcass saw, a saw I got from my aunt a long time ago. It's a Swedish backsaw, modern enough to have a fugly plastic handle but old enough not to have hardened teeth. I cleaned the rust from the plate a while back but haven't used it since. I remembered at once why that was - it wasn't sharp. Well I just had to sharpen it then, I mean I did buy a couple of saw files when I cleaned that rust off. But how to clamp it? I never got around to buying one of those nifty saw vises on ebay did I. Luckily I have seen Paul Sellers' wooden clamp so I made one similar to that. It can be seen in the pic, sort of, at the back. So after dinner tonight I sharpened the saw and actually got a decent result. 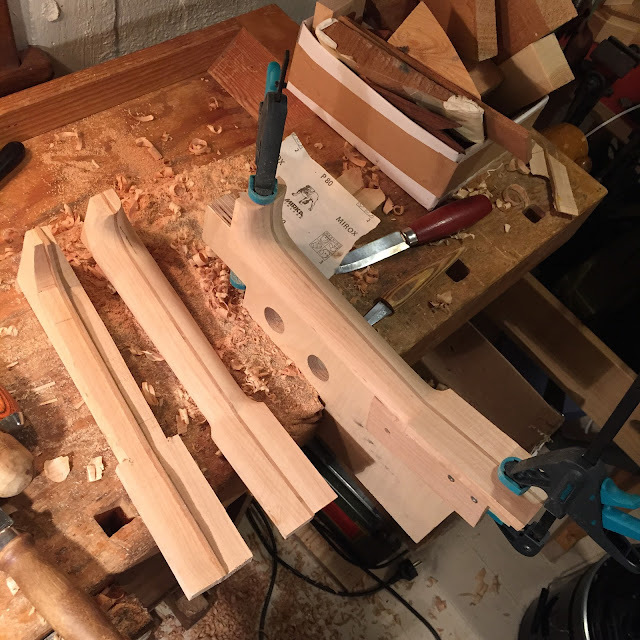 And then back to the necks! 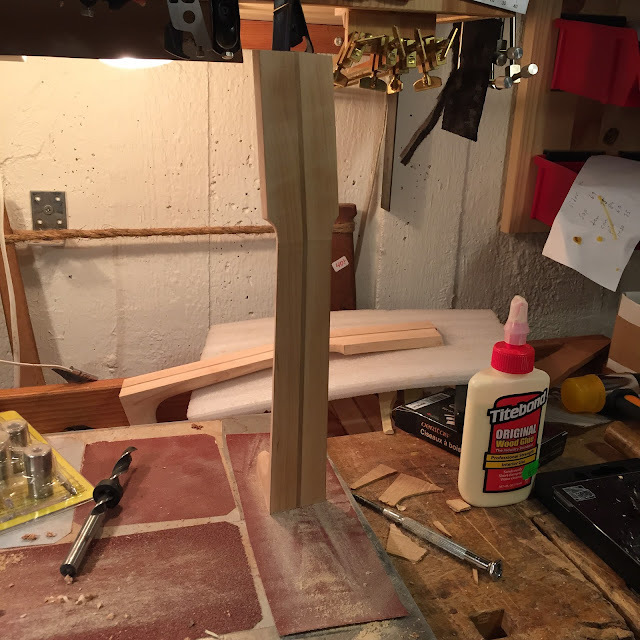 I set a bevel guage at the correct angle and scored both sides at the heel, a deep knife line which I, since a cross grain cut was next, made into a knife wall. Again, thanks mr. Sellers. 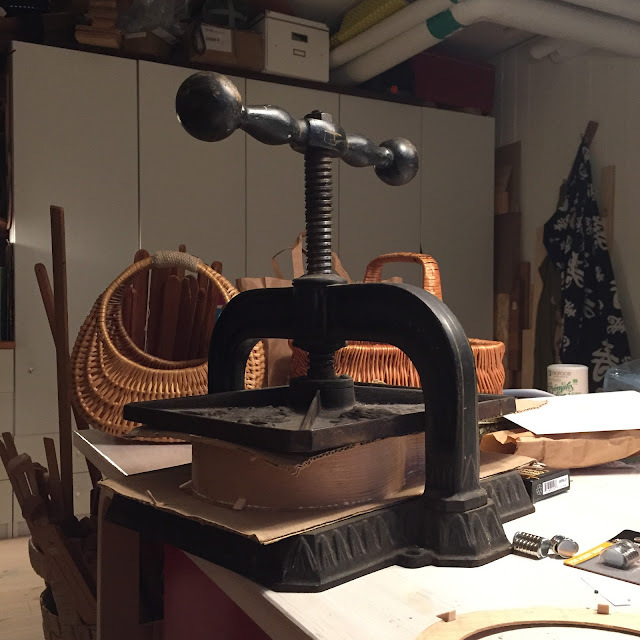 The first pic shows the saw and the prepared blanks. And the bench hooks. And a new chisel. And a couple of marking knives. 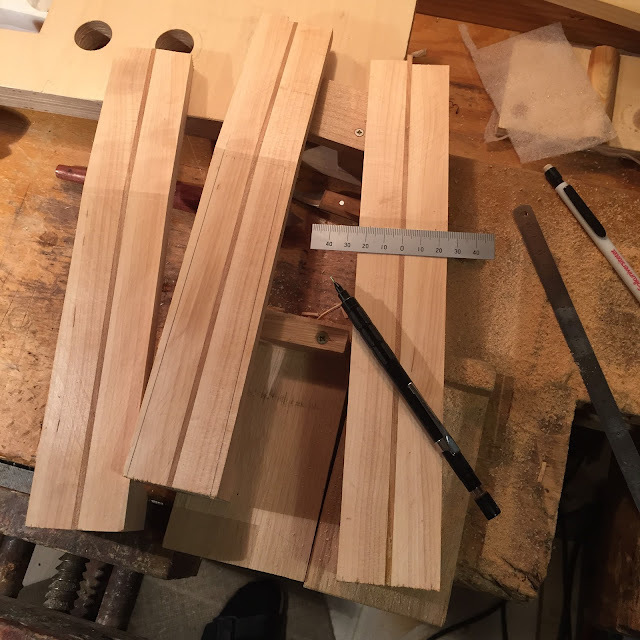 After cutting all three blanks I laid out the taper with a centre finding rule. That is a great tool, and the cherry stripe in the neck makes it dead easy to measure. 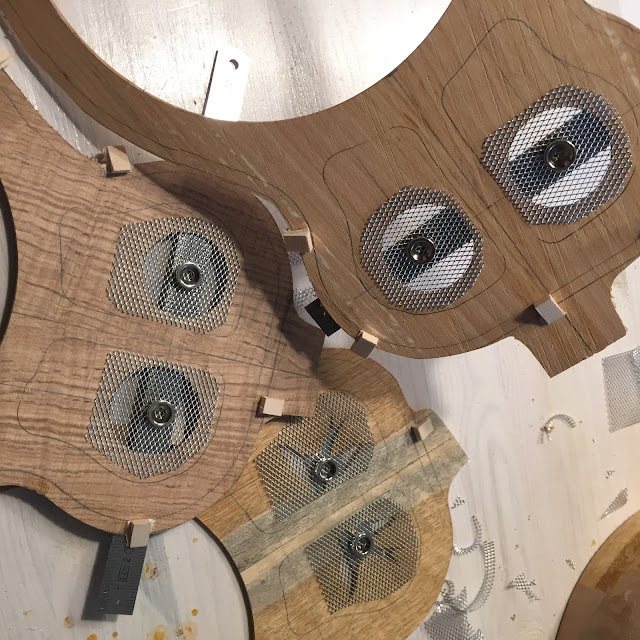 I set the width at 36 mm at the nut and 42 mm at the heel connection, which is at the 13th fret. Then I mark the taper at the heel face. 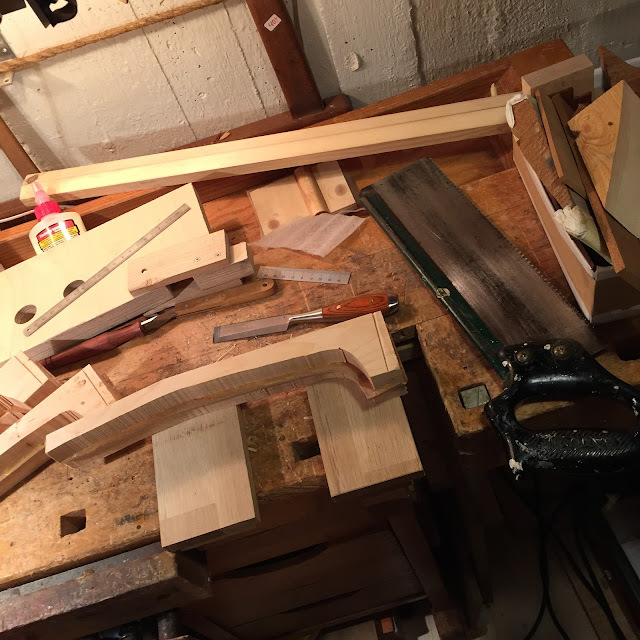 One neck won't get any and you can see why - the alder sides are a bit short so I need a full width heel to cover the gap. Now don't lie awake thinking that gap will magically reduce sustain and volume. I won't because it won't. Now it's about time to whip out that rip saw..! One last pic since I cleaned the workshop the other day. 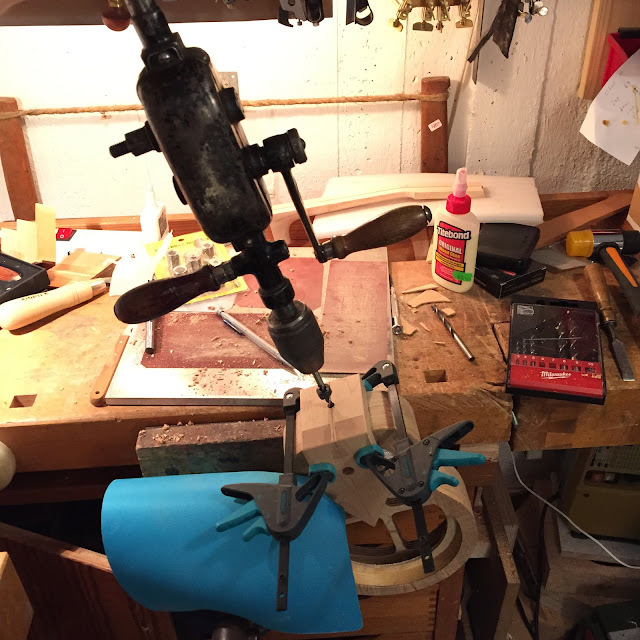 I mounted my Record vise on the bench and I love it to bits. Blue, really heavy bits. 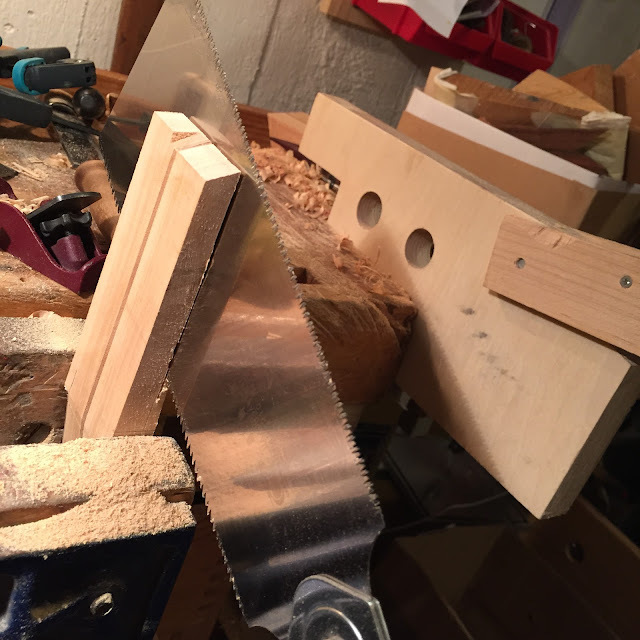 This was taken yesterday when I was planing the halves for the saw clamp.